Recently, my Dad took me out to dinner at this restaurant in the East Village called Dirt Candy (or as my Mom called it, “Dirty Candy”). Let me just tell you – the place is apparently impossible to get reservations at & only seats about fifteen people… and the food is AMAZING. Like, holy crap. Don’t ask questions, don’t think about it, just get yourself a reservation and go! Anyway, I decided to try something a little bit outside of my regular style that day. I don’t usually go for the plain or geometric metals when I pick out my jewelry, but I tried out Chloe + Isabel’s S-Chain Link Collar Necklace with black skinny jeans and the Shenandoah Tunic from Free People. I’m glad I went on a whim and threw on the links necklace because it opened me up to trying out styles of jewelry I might not usually go for. I normally would have styled a top like this with a longer, more boho necklace. 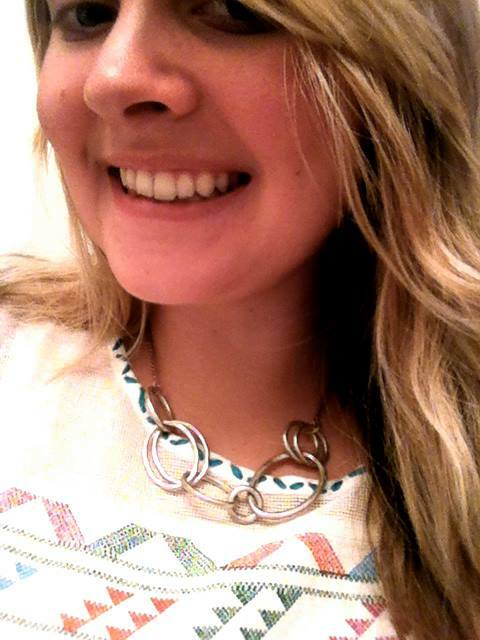 I think the combo of the boho top with the modern metal necklace turned out cool & unique! Takeaway lesson: try out unexpected combinations! Just to say hi & I’m having fun reading the Stylebandit and will try Dirt(y) Candy. Will Roger and I like it? Look forward to more from the Stylebandit!